Incat Crowther launched of Spirit of the Wild, a spectacular new tour vessel for Gordon River Cruises, and the first in Australia to operate in World Heritage-listed wilderness with Silent Drive. Offering interpretive tours into the heart of the UNESCO Tasmanian Wilderness World Heritage Area, Spirit of the Wild will give customers a unique natural experience. 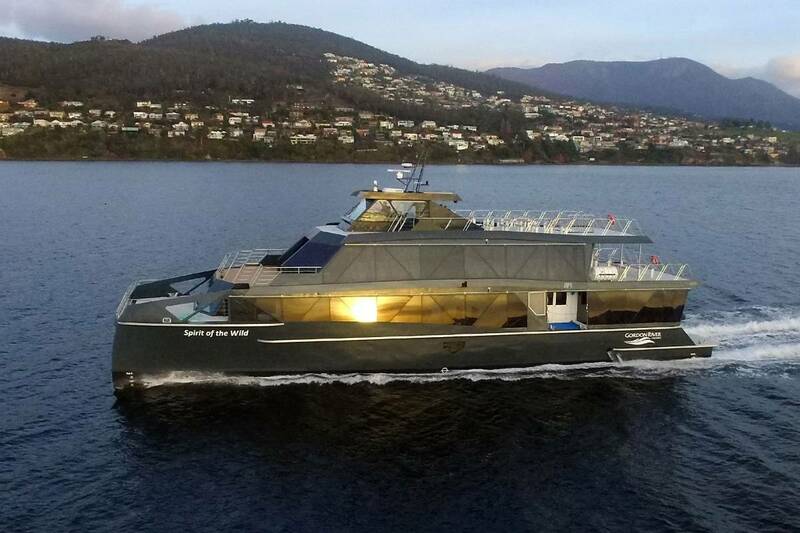 Built by Richardson Devine Marine, Spirit of the Wild is fitted with a pair of MTU 10V2000M72 main engines. Added to this is a cutting-edge hybrid electric system, consisting of a pair of ABB e-motors, driving Hybrid-ready ZF gearboxes. Particular attention was given to the mounting of the engines and gears to reduce the transmission of vibration and noise. The main engines’ modest rating is tailored to the local manning requirements. In open water, the vessel will use Boost mode from the hybrid system, which matches motor speed to engine speed to seamlessly add electric power. In this mode, the vessel operates at 25 knots. When the tour comes to the World Heritage-listed Gordon River, Silent Drive mode is engaged. In this mode, the main engines are shut down and the vessel runs on electric power. Spirit of the Wild exhibits excellent noise and vibration characteristics, even in Boost mode. Engine ventilation systems and the engine room were addressed with a fully-engineered acoustic insulation system. Attention was paid to fittings and door openings, with seals and bushes used extensively to stop rattles and gaps. In Silent Drive mode, the experience is eerily quiet, with seats returning sound level readings as low as 45dbA. Incat Crowther developed a vessel that utilized triangular side structure to enlarge openings and minimize obstructed viewing locations, wrapped in a stealth-like exterior design. Dark reflective floor-to-ceiling glass provides an unparalleled viewing experience and enables the vessel to ‘disappear’ into a backdrop of tannin-colored water and ancient wilderness forest. The vessel layout is designed around optimal viewing. 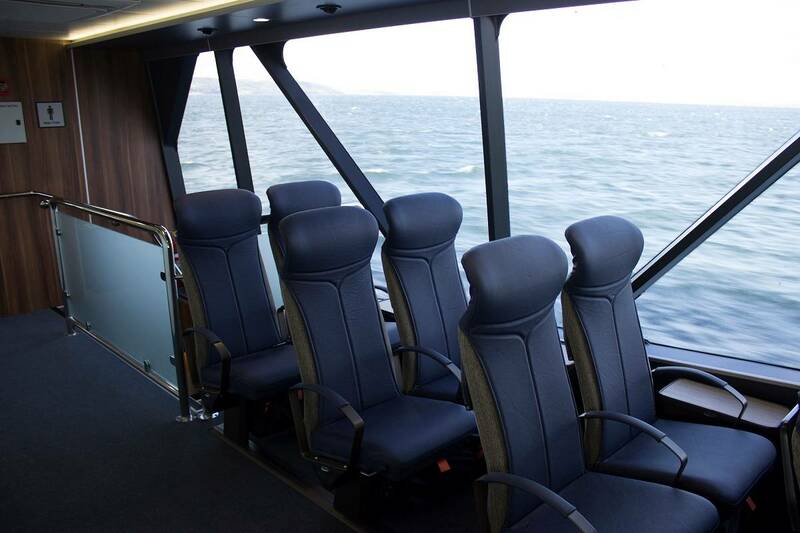 Every seat on the vessel was considered in the design to provide exceptional vistas. Service areas are located in the center of the vessel. The main deck side boarding areas, involving engine room ventilation and engine removal, were minimized, whilst the main stair case is open to avoid obstruction. With a high-end fitout featuring local timbers, the tour will further be enhanced by exquisite service and high-quality local cuisine. The galley and servery are linked by a dumb waiter, with the layout and function of the catering spaces attended to by a commercial food and beverage consultant. Interior features include the use of a stretched membrane ceiling in the upper deck, whilst the visibility is guarded by integrated demisting and exterior washing systems.